Having two kids in diapers can mean carrying a lot of stuff, even if you pack light. When I was just carrying stuff for one kid, I generally used a super tiny diaper bag, like a Petunia Pickle Bottom Cake Clutch or a Jolly Jumper diaper bag that was about the size of one of those backpack purses that were popular in the ‘90’s. That was with just one. With two? Well, between carrying clothes and burp cloths for Eudora (because that kid can puke a lot… I’ve gone through two cloth diaper burp cloths in one feeding from the baby barf), diapers, bottles, a sippy cup for Norton, some toys to keep Norton entertained (usually his bus or something else, plus maybe a ball if we’re going to the park), I’m carrying a huge diaper bag. And maybe another bag at the same time. It’s ridiculous. I like to travel light, even with two kids. I don’t carry a purse. I just tuck my wallet and my iPhone in the diaper bag, or I wear a hoodie and keep those things in the pocket. I had a moment of inspiration. I decided that Norton could carry his own stuff. I’m over “Mommy” being another word for “pack mule.” We went to Everything Baby, our local baby boutique, and started browsing. I was determined that Norton would pick out his own backpack so that he’d like it and want to carry it. Unfortunately, Norton discovered a Phil & Ted Explorer stroller that was exactly like ours and was more interested in playing with it. (When we left without the stroller, he freaked out. The husband had to take him out to the van and show him ours so he’d calm down.) Since I couldn’t get his attention to pick out a DC toddler backpack or a Skip Hop toddler backpack, I made an executive decision. The newest animal word that Norton had taken to saying before we went shopping was “elle.” As in “elephant.” He loves to flop down on the dogs’ elephant pillow pet in the living room and pointing them out in the nursery. I saw the Skip Hop elephant backpack and decided that we’d go for it. The other day, though, the light bulb finally came on. Norton was actually interested in carrying his bag. He had it over his shoulder like a purse, and was just as proud as he could be of his “elle.” When I helped him put it on his back, he was just amazed. 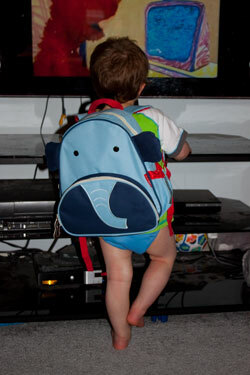 In fact, he spent the rest of that episode of Sesame Street with his Skip Hop toddler backpack on. And the timing was perfect. We’ve got a family reunion coming up, and I’d much rather him schlep his own stuff around instead of expecting me to do it. What kind of backpack did you get for your toddler?